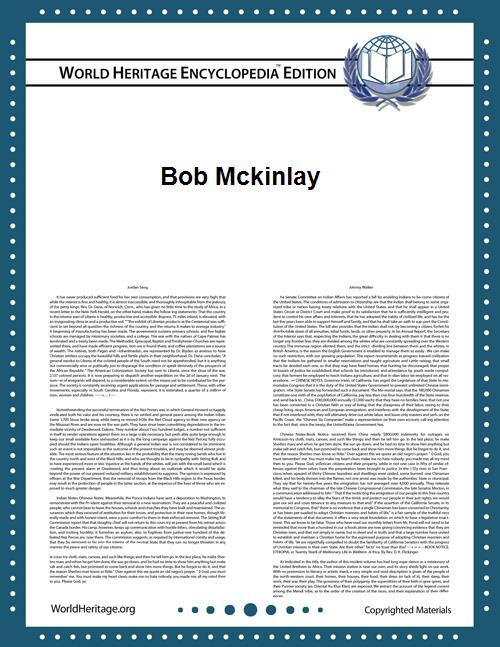 Robert McKinlay (10 October 1932 – 27 August 2002), known as Bob McKinlay or Bobby McKinlay, was a Scottish professional footballer who played as a centre half. McKinlay spent his entire career with Nottingham Forest, making 614 appearances in the Football League – a club record, including a run of 265 consecutive league games between April 1959 and October 1965; missing a single game against Aston Villa, he then played in the next 134 games. He won a FA cup winner's medal in 1959, and was Club captain from 1961 to 1966. Mckinlay joined Nottingham Forest at the beginning of the 1951-1952 English Football league season and was an ever-present in the side which made it to 4th in the English Division Two. The following season Nottingham Forest only managed to finish 7th in the same division, largely due to a loss of their impressive home form from the season beforehand. Mckinaly, although only 21 at the time, was again one of Forest's stand out performers that year. This biographical article related to a defender from Scotland is a stub. You can help World Heritage Encyclopedia by expanding it.